You’ve made your New Year’s resolutions and chances are chief among them are working out and eating healthy. You’ve begun eating a lot of chicken, fish and vegetables and have enthusiastically committed to working out every day. If you’re finding your motivation on that front waning, go back to the beginning. Reassess your goal. Go ahead; it’s okay. You want to take a hard look at your goal if you’re finding it hard to meet because you’ll leave it by the wayside and end up starting out the year feeling badly about yourself. 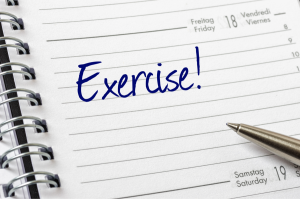 Set easier exercise goals and choose activities that best fit you, things that you enjoy to increase your chances of sticking with your goal. As you build confidence and your workout becomes more routine, you can introduce new activities that challenge you to reach for more. Be sure to schedule your workouts in your calendar. You’ll be more likely to keep those dates. If you’re a morning person, try to schedule your workouts before you start your day. If your only time to work out is right after work, pack your workout clothes and head straight to the gym. A stop at home or running errands after work are likely to sideline your good intentions. You’ll also increase your success rate by rewarding yourself for meeting short-term goals. Treat yourself to a warm bath, a few pages of your favorite novel or a cup of your favorite flavored coffee, etc. Finding a workout buddy also tends to keep you honest. You’ll be less likely to bail on your workout when you have someone else counting on you. Above all, be kind to yourself if you get derailed. Refocus and start again. Our specialized programs are designed to improve recovery, encourage independence and promote a return to the highest quality of life. For more information contact us today at 925.271.9100 or visit us online.